Intel and Warner Bros have are looking to conceptualize the implications of autonomous cars, collaborating on a unique concept car experience that transports passengers to Batman's Gotham City and envisions what in-car entertainment could look like in the future. “The emergence of autonomous vehicles portends a major shift in how people use their time. The concept car shows how cars will become a new kind of ‘space.," says Marcie Miller, Automotive Strategic Marketing, Intel Corp. 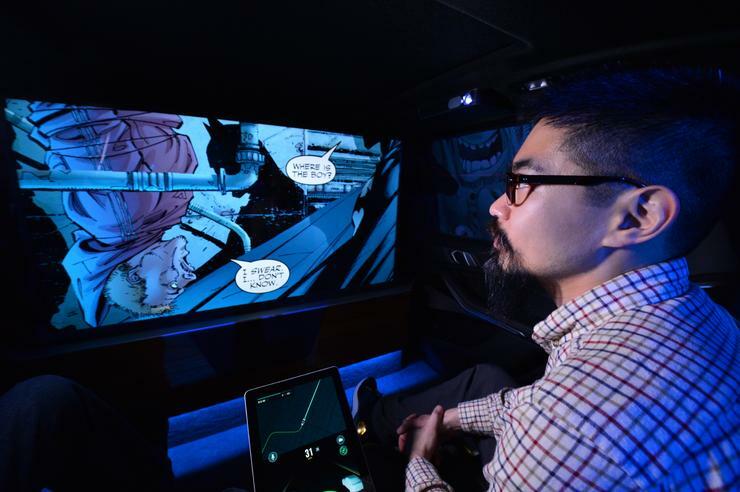 The concept car (which is a retrofitted 2019 BMW X5) incorporates a large screen TV, projectors, mobile devices, audio and lighting to immerse passengers on a virtual ride moderated by Batman’s butler, Alfred Pennyworth. Once they enter the car, users are able to choose and view various content to pass the time for their simulated trip on a built-in 270-degree screen. The demo specifically showed off trailers for various Warner Bros films and DC comics but it's easy to imagine almost any modern entertainment fitting into this setup - assuming your trip is long enough to actually consume that content. A tablet situated in the center of the car's passenger area will show the real-time status of their trip and give an indication of how Intel's RSS autonomous car tech sees the world. Though immersive entertainment was a big focus of the demo, it was still pretty easy to look and see how the autonomous car reacted to any unforeseen complications. The Intel-WB demo envisioned a futuristic entertainment experience that automatically paused content and ask for the passenger's authorization if it needs to perform a route change, and one that warns you when you're nearing your destination. Though it'll likely never become available to consumers, the demo is a unique showcase for some of the new directions that in-car entertainment could grow once autonomous vehicles become more established and mainstream. Intel are saying that the coming “Passenger Economy” will result in more than 250 million extra hours of commuting time per year for some of the most congested cities in the world. You gotta fill that time with something, right?